Denon have revamped their existing Envaya wireless speakers, and we can expect great things from them. The original Denon Envaya speakers was awarded 4* from What Hi-Fi?, so we look forward to seeing how the new ones are reviewed. These new range of speakers are comprised of three models (in size order): Envaya, Envaya Mini and the Envaya Pocket. The Denon Envaya is best suited for use in the home or garden, the Mini is smaller and is best better when used in small rooms, and lastly the Envaya Pocket is perfect for music on the go. The design of these speakers have a more minimalist style compared to the previous model. All three speakers have the same look, and all three have a new cloth grille. The new speakers feature Bluetooth aptX, to make sure that you get the best sound possible, and has a brilliant 30m Bluetooth range so you can wonder about the house and still listen to your tunes. The Denon Envaya wireless speakers have IP67-rate waterproofing, meaning you can leave them underwater for an amazing 30 minutes. No need to panic now if you get a few splashes on it, or drop it in the bath, give it a shake and keep playing. The battery life differs for each model, the Denon Envaya gives you 13 hours, 11 hours from the Envaya Mini and 10 hours from the Envaya Pocket. To charge the speakers can be anywhere from 2.5 hours to 4 hours, not too shabby. Also, all three speakers are compatible with Siri (we were surprised too), so you can control these speakers with your voice at a push of a button. The Denon Envaya speakers have a good amount of power despite the size of them. The regular Envaya is driven by 2 x 13w, the Mini 2 x 8.5w, and the Pocket by 2 x 6.5w. You can customise these speakers by attaching either the grey or black carry straps. 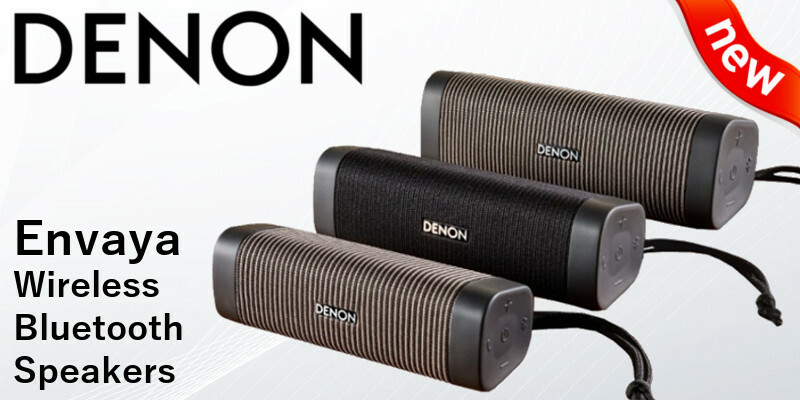 Denon’s new range of Envaya Wireless Bluetooth speakers are something to look forward to. Bring the whole house to life with music, or play music in a single room, whatever the size you’ll be happy.